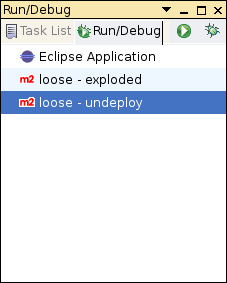 Run/Debug plugin is a tool for launching run/debug configurations more simply. ability to select launch configuration by pressing keys up/down and confirm by enter. 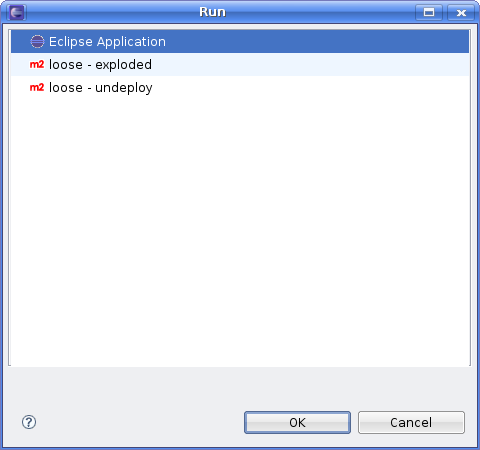 Eclipse 3.1-3.3 Update Manager: you can use special Eclipse update site for plugin presented here. Go to "Help -> Software Updates -> Find and Install... -> Search for new features to install -> Next -> New Remote Site..." and use the https://web.loose.cz/plugins/eclipse/ as url. 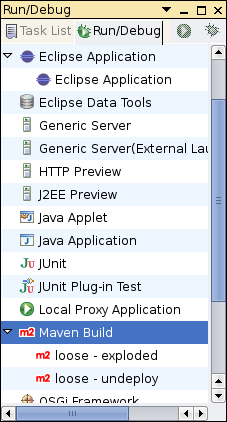 Eclipse 3.4 Update Manager: you can use special Eclipse update site for plugin presented here. Go to "Help -> Software Updates -> Available Software -> Add Site..." and use the https://web.loose.cz/plugins/eclipse/ as url. This plugin has been tested only on Eclipse 3.4 - GNU/Linux 32bit.